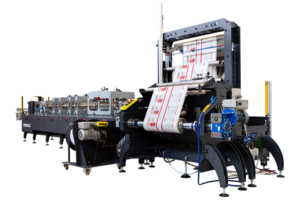 Karlville recently launched its new pouch making machine, the KS-DSUP-400 at Pack Expo International 2018 in Chicago, USA. 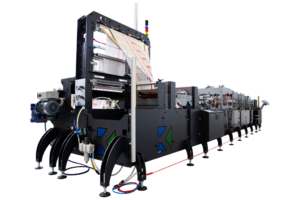 The KS-DSUP-400 machine, manufactured in Europe, is a compact easy to use machine designed for short run conventionally and digitally printed pouches. The main advantages are quick changeovers, typically 15 minutes and very low scrap rate, typically not using more than 20meters of set up waste. The machine is of a compact design slightly more than 8m in length and 2m in width. Quick change tooling for the bottom Doyen seals and quick parameter machine setting minimises change over time and set up waste to an absolute minimum. 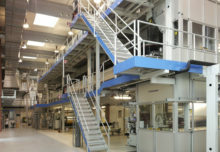 The machine may also have the options of two web print re-registration combined with insert gusset capability allowing narrow web conventional and digital printers to achieve taller stand up pouches than currently available via conventional stand up pouch converting technology. The KS-DSUP-400 is an ideal platform for narrow and mid web conventional and digital printers to enter the fast-growing stand-up pouch market with a relatively low capital investment. 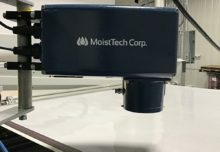 The machine is designed to allow novice converters to easily learn how to make pouches and enter new profitable markets which are growing faster than the traditional label and flexible packaging market. The market is seeing significant growth in demand for pouches as well as many start up business preferring pouches as their choice of packaging medium where the demand short runs and fast turnarounds to launch products is required. Cyber Graphics announced as Bellissima DMS trade shop partner for U.S.